I haven't been able to find a post specifically on fluted knives, so hopefully this isn't a duplicate. I was wondering if fluted knives actually work. I came across a comment (possibly an Amazon review) that fluted knives don't actually help in preventing vegetables from sticking to the knife -- causing the user to have to still have to stop and remove the cut product. I've never used a fluted knife, so I literally have no idea. I was wondering what the general consensus on SA was: Have you noticed that a fluted knife makes enough of a difference to purchase the fluted version of a particular knife over the non-fluted version? For most use, it simply doesn't matter. In fact, the thickness of the blade tends to have more of an effect than the voids in most cases. This is a pretty intricate question and my answer is based on what I have read and personal experience. If I understand correctly, knives with dimples or scallops are supposed to create more air space between the knife and the food, thus reducing adhesion and making release of the food easier. This seems to be the reason most stated for an advantage of this kind of knife. As you stated, even though you have upgraded and added knives to your collection, you usually reach for your Wusthof. 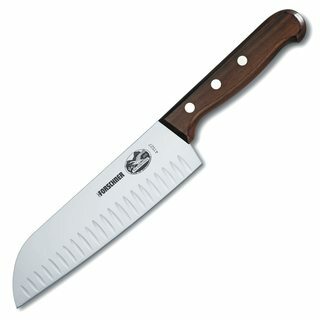 We have knives of all types, from fairly cheap to pretty expensive. We do the same thing -- reach for those trusty favorites. I don't know if this qualifies for an ideal answer and I'm sure that there are many others with more knowledge of the science behind this. But, I do think that as long as you are using an appropriate type of knife for your task and it feels good in your hand, you can't go wrong. It also depends on how deep the channel is. The purpose of the channels is to reduce the surface area of the knife that comes into contact with the food you're cutting. The lower that surface area, the lower the friction for cutting. Channels can be effective for cutting hard products (e.g. hard cheese or vegetables) where the food product is rigid enough that it won't bend into the channels after it is cut. On the other hand, channels are less effective with products like large chunks of meat where the product will tend to fill in the channel because it's elastic. Cutting technique also makes a difference to channel effectiveness. If you are using a drawing motion while cutting (i.e. drawing the blade across the product), that will tend to increase the effectiveness of channels because you are not giving the product enough time to reform around the channel so the surface area of contact remains small. That is why carving knives often have channels in them...the slicing movement works well with channels. Ahhhh!! !, I answered once in more detail and it deleted because inwasnt signed in!! The wells (not scallops- that makes me think bread knife). Are supposed to capture fluid and make for smoother slicing. 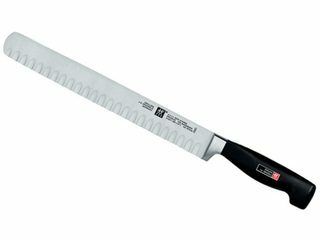 Though, a Santoku should have a different angle of sharpened edge than a "western" edge. So you may lose slicing ability in your inability to properly sharpen. A nice knife but it doesn't replace my 6" chef's knife. I was very pleased to find this discussion. It confirms what I'd always suspected; that for fine slicing you can't beat a good, thin, flexible and flat blade. I'll add that fluted/scalloped/Granton blades can be a hindrance for wafer-thin slicing. That's because the food undulates as the blade passes through, and so you're likely to end up with shattered little flakes instead of delicately thin slices. The only exception in my experience is Gouda and Edam cheeses, which are sufficiently plastic to benefit from the science involved. If you're a Dutch cheesemonger, then go for it. What are the tradeoffs between spiral and C-shaped dough hooks?